A young girl named June uses her imagination to create a splendiferous amusement park. When she enters a stressful time in her life, a "darkness" looms over the park and begins destroying it. Now, she must find a way to fight this "darkness" and restore the park to its former glory. While watching "Wonder Park," the only question that plagued us was, "what did June's dad do to make her believe that he's such an absolute moron that he's incapable of taking care of himself?" "Wonder Park" is a Nickelodeon animated feature that is apparently directed by nobody. The individual who made the majority of this project was removed as the director due to complaints of inappropriate behavior. This story focuses on a young girl named June (Brianna Denski), who along with her mother (Jennifer Garner) has invented an imaginary amusement park called......Wonderland. HA!!! 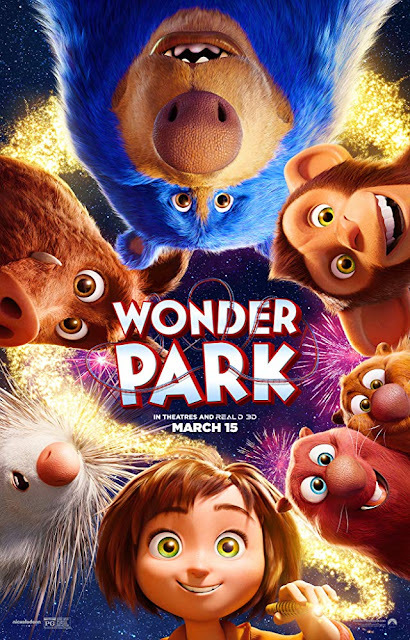 You thought it was going to be called Wonder Park, didn't you? The trailer lied to you all! When her mom gets ill and has to go away for a while to get better, June falls into a deep depression and decides to put Wonderland away. June is supposed to spend the summer at math camp, but on the way there, she decides that her father (Matthew Broderick) couldn't possibly take care of himself on his own, so she ditches the bus and starts to head home. On her journey, June finds that her imaginary park has come to life in the forest and is being destroyed by a looming "darkness" hanging in the sky overhead. Now, she and the critters of Wonderland, Greta (Mila Kunis), Steve (John Oliver), Cooper (Ken Jeong), Gus (Kenan Thompson), Boomer (Ken Hudson Campbell), and Peanut (Norbert Leo Butz), must find a way to save her and her mother's creation, all while fending off the evil chimpanzombie dolls wrecking the park. We may drift into SPOILER ALERT territory during this review because the marketers of "Wonder Park" saw fit to purposefully hide a major plot point from the trailers that we can't ignore discussing in our review. We have seen many animated features that attempt to deal with serious subjects like death and illness (most notably "Grave of the Fireflies," "Coco," "Bambi," "Up," "The Iron Giant," "All Dogs Go to Heaven," etc). "Wonder Park" tries to have an emotional heft to its story, but it lacks the courage and conviction to commit to fully exploring the subject with grace and dignity like the films mentioned above do. Instead, what we wind up with here is an uneven, chaotic adventure flick with a shoe-horned-in sub-plot about June's mom getting sick while talking animals battle out with sentient stuffed zombie-monkeys. All of this rampant zaniness is meant to be a metaphor for the inner turmoil June faces, but it's a little overly simplistic. We get that it's a movie for kids, and we understand that not everything can include Pixar-levels of deepness, and this may sound messed up, but if you're going to commit to killing a parent, either do it and get it over with or don't bring it up. The ending undoes everything that came before it with one small scene. The rest of the Wonderland insanity plays out in a vibrant-but-haywire manner, though it doesn't fit with the tonal sadness set early on, making the entire thing feel like it clashes. That being said, we liked a few things about this movie. We like that it tries to inspire kids (particularly young girls) to use their imagination and to value things like science and math. There are a couple of fun, exciting, and action-packed moments as well, though they are usually interrupted by a dopey line of dialogue or a silly snorting warthog (C'MON, THEY CAN'T ALL BE PUMBA). The animation looks good for the most part, but that should really be the bare minimum of standards for a theatrically released animated feature. We really enjoyed some of the voiceover work (John Oliver kills it, unsurprisingly, and we thoroughly appreciated Ken Hudson Campbell as Boomer), but the laughs don't come as often as we hoped they would. "Wonder Park" is a lot better than we expected it to be, but this is easy to say when we had no expectations for it whatsoever. The trailers hide the crux of the story because they were afraid parents wouldn't want to take their kids to see something that deals with the illness of a family member, but parents probably shouldn't take their kids to see this movie because it's just not very good. The film doesn't explore its subject fittingly, and some of the narrative choices were disappointing. In the end, it left us wanting a bit more than what it had to offer.